Through the years, Bell Construction Co., Inc. has become known as a turnkey provider for site development. We oversee everything on a job site from the cutting of the first tree to the painting of the last parking space and we are known for consistently turning out quality site development projects. Municipal work is a significant part of our work. From emergency repairs, to water, sewer, and storm drain replacements, to major Streetscape projects, Bell has successfully completed many Municipal contracts. Because of our knowledge, expertise, and integrity, we have become a preferred contractor for many municipalities in the region. In part, this is possible because we perform most of our work with our own work force. However, when the need for a sub-contractor arises, we predominantly use the same group of sub-contractors and have for many years; therefore our quality is the same from job site to job site. 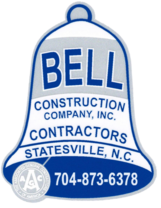 Aside from being a registered contractor in North Carolina, Bell Construction Co., Inc. is also apart of the Associated General Contractors of America. Highly regarded in Statesville, NC and the surrounding communities, Bell Construction was also a finalist for the 2009 CAT Contractor of the Year.